About Us ~ Our Pastors . . .
A strength which the pastors bring to the congregation is that this is a second career for each of them, providing them a perspective from both sides of the pulpit. Pastor Leo graduated from the University of Montana with a B.S. in Forest Science. After working with a forest consultant for several years, he entered the US Air Force to change careers, studying electronics as an Air Traffic Control Radar technician. Following his tour of duty, he obtained a position with a Maryland-based firm where he worked for a number of years as an electronics technician and then as an engineering writer. Pastor Melissa graduated from Western Maryland College (now McDaniel) with a B.S. in Mathematics and Art. She taught middle school mathematics for several years before taking a position as an engineering programmer with a State of Maryland agency. She also completed a master’s degree at the Johns Hopkins University, and eventually retired from a career in information technology. In 1993, both Pastor Leo and Pastor Melissa, separately, had life changing experiences by attending Walk to Emmaus, and they continue their involvement with “Fourth Day Ministries” such as Emmaus, Credo and Kairos. Pastor Leo is currently active with Kairos International Prison Ministries, serving at the Roxbury Correctional Institution in Hagerstown, MD as clergy on the ministry teams. Part of this ministry is attending “prayer and share” gatherings led by the inside brothers several times a month as part of maintaining the fellowship and bond between Christian brothers. Pastor Melissa primarily participates with Credo, which ministers to those behind the “walls” formed by hurts, habits and hang-ups – either their own or someone close to them. 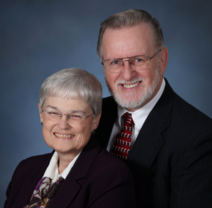 Both pastors have completed the Church of the Brethren Training in Ministry (TRIM) program administered by the Brethren Academy for Ministerial Leadership, in partnership with Bethany Theological Seminary in Richmond, Indiana, and were ordained in February 2015. A second marriage for both, they have a combined total of six children and eleven grandchildren and reside in Littlestown, Pennsylvania. Pastors Leo and Melissa Barnes were called to a full-time pastorate with Bush Creek on November 16, 2014. Prior to this they served the Bush Creek congregation as interim pastors during the summer of 2013 and again following the retirement of Pastor Charlie Beekley on March 31, 2014.